The announcement for the March 25 event, sponsored by NYU's Asian/Pacific/American Institute, makes no reference to Sarsour's divisive views. It ignored the fact that the national Women's March, which Sarsour helps lead, lost a number of significant sponsors including the Democratic National Committee (DNC), the Southern Poverty Law Center (SPLC), Emily's List and the National Organization for Women (NOW), due to concerns about anti-Semitism and other issues from Sarsour and her colleagues. Instead, it describes her as a "racial justice and civil rights activist" who is "[b]est known for her intersectional coalition work and efforts to build bridges across racial, ethnic, and faith communities." 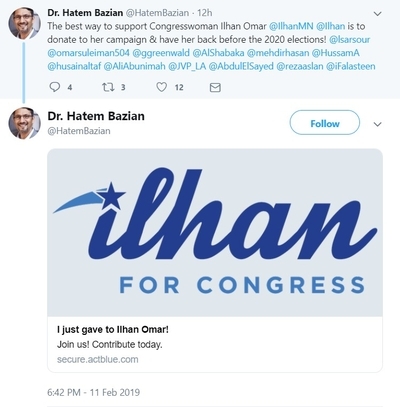 The missing caveat: She'll build bridges as long as you share her hatred for Israel. In 2015, Sarsour pointedly rejected any solidarity gestures from people who want to stand by Muslims but also support Israel or oppose the campaign to boycott the Jewish state economically, academically and politically. It built on her 2012 claim that "Nothing is creepier than Zionism," a tweet that remains on her feed today. And, as the Investigative Project on Terrorism reported last fall, Sarsour finds a way to blame Jews for police shootings of unarmed black people. She points to a program run by the Anti-Defamation League that takes police officials for a week of seminars in Israel, "so they can be trained by the Israeli police and military, and then they come back here and do what? Stop and frisk, killing unarmed black people across the country." They are similar to a viewpoint she offered in 2015 during a speech at the 20th anniversary of avowed anti-Semite and Nation of Islam leader Louis Farrakhan's "Million Man March." "The same people who justify the massacres of Palestinian people and call it collateral damage are the same people who justify the murder of black young men and women," she said. It's not as if NYU's Asian/Pacific/American Institute had no warning. Sarsour's 2017 participation on an anti-Semitism panel at the nearby New School drew widespread criticism. NYU placed ninth among the nation's worst campuses for Jews in a 2016 Algemeiner assessment because "NYU's was one of the first graduate student governments to pass a BDS resolution, and Jewish students have been subject to antisemitic attacks, such as being served mock eviction notices." School officials pushed back, but in December, it temporarily shut down the Bronfman Center for Jewish Student Life after finding "several public online postings by an NYU student which were antisemitic in nature and potentially threatening." Sarsour has not tried to explain or walk back her anti-Semitic comments. But she still is considered a worthy choice for an academic program at one of the country's most prestigious institutions. That's probably not going to help with those rankings. President Trump's Special Envoy to Syria Joel Rayburn reportedly met Monday in Istanbul with a delegation that included a high-ranking pro-Turkish Syrian rebel leader who endorsed al-Qaida-linked rebels. 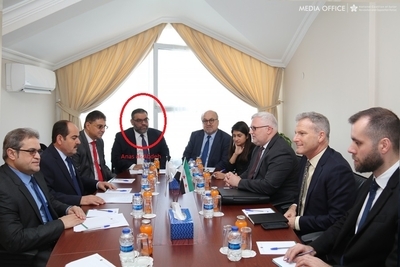 A photo posted by the National Coalition of Syrian Revolution and Opposition Force, known by the Arabic acronym ETILAF, shows the group's former president, Anas al-Abdeh, attending the meeting. Al-Abdeh is not named in the post, but he appears in the upper left corner of the photo. "They are all in the same trench," Al-Abdeh said in 2016 about the Free Syrian Army (FSA) and the al-Qaida-linked Al Nusra Front. "We cannot differentiate between fighters ..."
The State Department did not respond to a request for comment about al-Abdeh's presence at the meeting. This week's Istanbul gathering focused on developments in Syria's Idlib province, a statement on ETILAF's website said. This meeting otherwise went unreported. Hayat Tahrir al-Sham (HTS), the successor organization to al-Qaida's former Syrian affiliate, Jabhat al-Nusra, currently controls Idlib. Al-Abdeh opposed the ultimately successful effort by the Kurdish-dominated Syrian Democratic Forces (SDF) to cleanse ISIS from its self-proclaimed capital of Raqqa due to his alignment with the Muslim Brotherhood and Turkey's ruling Justice and Development Party (AKP). The Obama administration spent $500 million training and equipping Syrian rebels linked with the FSA, but only succeeded in training four or five fighters before President Trump ended the program. FSA forces formed a major portion of Turkey's invasion force in the Kurdish-dominated Afrin region in northwestern Syria. Since the FSA took control, an extremist interpretation of sharia has been implemented, Yazidis have been forcibly converted to Islam, and some ethnic cleansing already has taken place, Afrin native and current Syrian Democratic Council (SDC) Executive Director Ilham Ahmed said earlier this month during a visit to Washington. The SDC is the civilian political arm of the SDF. The FSA has been closely linked with Turkey's security services since the start of the Syrian Civil War in 2011. Its operations are closely linked with Turkey, which has used it as a proxy against the Kurds. ETILAF announced in December that FSA militias will participate in an anticipated Turkish invasion of SDF-controlled northeastern Syria and effort to create a Turkish-controlled "safe zone" along the Syrian-Turkish border. HTS leader Abu Muhammad al-Joulani also has endorsed participating in the Turkish offensive. Turkey says it will not attend a U.S.-sponsored summit set to be chaired by Secretary of State Mike Pompeo today because it's "anti-Iran." This United States and Poland set up the meeting to organize allies against Iranian influence. Sixty countries, including Saudi Arabia and Egypt, are attending, Hürriyet Daily News reported. Israeli Prime Minister Benjamin Netanyahu will attend. Qatar also is noticeably absent. "Turkey's political participation that targets one country is out of the question," said a Turkish Foreign Ministry spokesperson. "Our embassy in Warsaw will follow it." When the issue is Israel, Turkey lacks such apprehension. Following President Trump's decision to move the U.S. Embassy to Jerusalem, Turkey called on the Organization for Islamic Cooperation to convene an extraordinary summit to confront the decision. While posturing as an American NATO ally in the Middle East, Turkey increasingly has become cozier with U.S. adversaries like Iran. President Recep Tayyip Erdogan denounced new Trump administration sanctions against Iran as "imperial" and told U.S. officials it would not implement them. Turkey gets an estimated 200,000 barrels of oil per day from Iran at full at full capacity, as well as a fifth of its gas imports. "We buy oil from Iran and we purchase it in proper conditions. What is the other option?" Turkish Foreign Minister Mevlut Çavuşoğlu asked last June. A federal court in New York convicted Turkish banker Mehmet Hakan Atilla last May of participating in a scheme to violate U.S. sanctions on Iran. Atilla and others conspired to give the Iranian government and associated entities access to restricted oil revenues through U.S. and international financial networks. The conspirators lied to U.S. Treasury officials about Turkish state-owned Halkbank's involvement in actions to help evade U.S. sanctions. Documents fraudulently disguised prohibited transactions with Iran as humanitarian in nature. Co-defendant Reza Zarrab claimed that these transactions could not have taken place without Erdogan's approval, a hushed 2013 probe by Turkish prosecutors found. Turkish prosecutors found evidence that suggested that Erdogan received kickbacks from the transactions. Tehran received at least $13 billion in 2012 and 2013 alone due to this scheme. President Trump granted Turkey a waiver from U.S. sanctions in November. Turkey's cooperation with Iran isn't limited to economics. Both countries oppose the Kurdish Workers Party (PKK). Iran and Turkey have vowed to work together following the U.S. pullout from Syria. This pattern reiterates that Turkey's alliance with the U.S. only exists on paper.